Hanuman Jayanti is one of the important Hindu festivals. Hanuman Jayanti refers to the celebrations held to commemorate the birth of Lord Hanuman. Lord Hanuman is considered as the 11th incarnation of Lord Shiva. He is worshipped as a symbol of physical strength, energy, devotion, courage and victory. Hanuman Jayanti is celebrated on different days across the States in India. While in most of the States the festival is celebrated on Chaitra Shukla Poornima (full moon day, in the month of April), in the State of Maharastra, it is celebrated on the Ashwin Krishna Paksha Chaturdashi (14th day of waning moon in October- November). In Kerala and Tamil Nadu, Hanuman Jayanti is celebrated on Marghazi Amavasya (Dec15th – Jan 15th). In Karnataka and Andhra Pradesh, Hanuman Jayanti is celebrated on Vaishaka Krishna Paksha Dashami (in the month of May, 10thday of waning moon). In Odisha, the festival is celebrated on the first day of Vaishaka month as per the Odisha calendar (April 14th– 15th). The day is also celebrated as New Year – Maha Vishuva Sankranti. Hanuman was born on Moola Nakshatra. Hanuman is known by other names such as Pavanasuta, Bahubali, Anjanaputra, Mahavira, Sankat Mochan, Maruti, Rudra etc. On the day of Hanuman Jayanti, prayers are offered in the early morning, as Hanuman was born at sun rise. Spiritual discourses are organised at the temples from dawn. After sun rise, celebrations are stopped for a brief period and the food offered to the Lord, Neivaidhya is distributed as Prasadamong devotees. Devotees usually visit Hanuman temple in the morning and pay their obeisance to the Lord. The devotees then apply sindhoor from the body of Lord Hanuman as tilak on their forehead. Once when Sita Mata was applying sindhoor on her forehead, Lord Hanuman was curious to know the reason behind applying Sindhoor. Sita Mata said that She applied sindhoor to ensure longevity for Sri Rama. Hanuman immediately applied sindoor all over his body to ensure immortality to his beloved lord- Sri Rama. Devotees also chant Hanuman Chalisa and 108 names of Hanuman. The word Hanuman is derived from the Sanskrit word “Hanu” and “man”. Hanu means, jaw and “man” or “mant” is prominent or disfigured. So Hanuman means “one with prominent or disfigured jaw. According to Skanda Purana, Lord Hanuman was born to Anjana Devi and Vayu, the god of air. Anjana Devi was a Devaloka apsara known by the name- Punjiksthala. In her previous birth as an apsara, she was cursed by a sage to be born as a female monkey on earth. The curse could be absolved only when she gave birth to an incarnation of Lord Shiva on earth. Thus Punjiksthala was born as Anjana Devi, the daughter of Kunjar (King of monkeys on earth) and got married to Kapiraj Kesari of Mount Sumeru. Anjana Devi, knowing about the curse of her previous life prayed fervently to Lord Shiva. Lord Shiva was pleased with her prayers and granted her the boon that He would be born as her son. Thus Hanuman was born to Anjana Devi and is considered as the incarnation of Lord Shiva. Another puranic reference is about how Anjana Devi conceived Hanuman. Dasharatha, the King of Ayodhya performed Putra Kameshti Yagna to beget children. All the gods were pleased by the Yagna and Agni, the god of fire offered a vessel of Prasad to the king to be shared among his three wives. Incidentally, a kite snatched a part of the Prasad and Vayu, the god of air carried the Prasad and dropped it in the hands of Anjana Devi who had outreached her hands while praying to Lord Shiva. When the Prasad fell into her hands, she considered it as Prasad from Lord Shiva and consumed the same. Then she gave birth to Hanuman. Thus Vayu became Hanuman’s father. Hanuman was a very naughty child. When Hanuman was born, he mistook the Sun for a ripe mango and leapt to eat it. Rahu, a lunar node was also seeking out to eclipse the Sun. Hanuman and Rahu clashed with each other and then Hanuman thrashed Rahu to take the Sun in his mouth. Enraged at the child, Rahu complained to the Lord of Devas, Indra about how the Sun could not be eclipsed due to the child. Indra threw his Vajrayuda, a weapon at Hanuman. 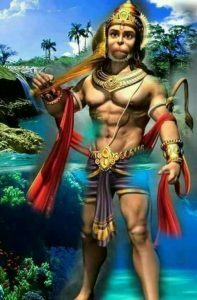 The weapon hurt the jaw of Hanuman and he fell down on earth unconscious. Vayu, father of Hanuman became angry on learning about his son’s injury, and withdrew the air on earth. All the gods started to asphyxiate. Indra withdrew the effect of his weapon and all other gods blessed him with several boons to appease Vayu. From Brahma, Hanuman got the blessings that he would not be killed by any weapon in the war. Brahma also blessed him with the power of destroying enemies, changing his form at will and the ability to travel over long distances easily. He got the boon of longevity, spiritual wisdom and ability to cross over the ocean from Lord Shiva. Indra blessed Hanuman with a body that would become even stronger than vajra, diamond. Varuna, blessed Hanuman of ever being protected from water. Agni, the god of fire blessed him with being unharmed/ indestructible by fire. Vayu, blessed him with speed faster than himself, i.e air. Lord Surya, granted two Siddhis of Yoga: Laghima and Garima i.e, to be able to transform himself into the smallest or the highest form. Yama, the god of death, blessed him with immortality. Kubera, the Lord of wealth blessed Hanuman with happiness and contentment. Vishwakarma, the architect of Devaloka blessed Hanuman that he would ever be protected from all his creations such as objects or weapons. 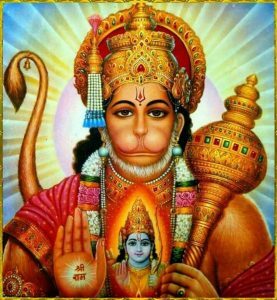 Thus Hanuman was blessed by all gods. Hanuman was very mischievous in his childhood. He would sometimes trouble the sages meditating in the forests. 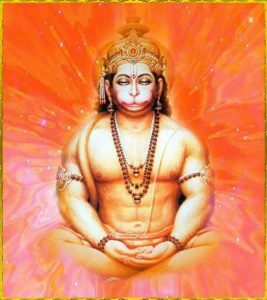 Unable to bear his pranks, one of the sages, cursed Hanuman that he would forget his abilities when it was most required, unless reminded by another person. 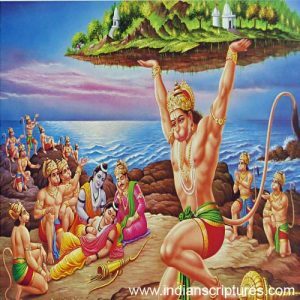 In Ramayana, when all the Vanaras were discussing about how to cross over the ocean it was Jambavanta who reminded Hanuman of his abilities and encouraged him to find Sita Mata. In Ramayana, Hanuman’s unflinching devotion to Lord Rama is unparalled as a Dasya bhakta. In Mahabharata, Hanuman was on the flag of the chariot of Arjuna signifying victory for Pandavas.